Sick of people stealing your content? Don't be! Sick of people stealing your content? Don’t be! You would have to be blind to not realise that in the world of blogging stealing content is getting more and more common (some would say out of control). People can take your RSS link and repost all of your content whenever they like. This in turn may hurt your Google ranking as Google doesn’t like duplicate content. However if you submit your content to Google via a sitemap then they may see you are the ‘original’ source. I have found a handy WordPress plugin that will allow you to embed your website link and also article link inside your RSS feed. I recommend you add it to the top as quite often the ‘aggregator’ will only take the first paragraph. 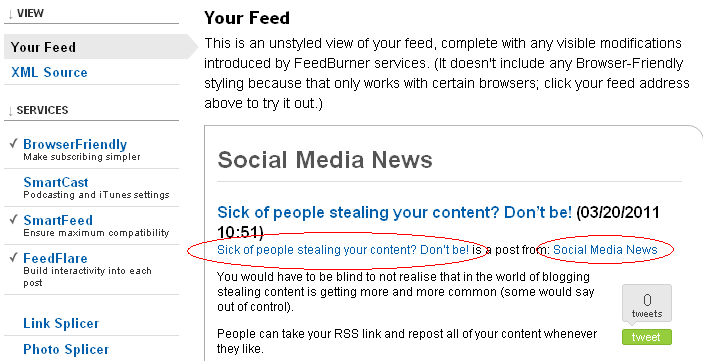 Now if you add your links at the top of your RSS feed content you will be getting free links from everyone stealing your content. So the quality of these new inbound links may not be the best! But they are better than nothing – and occasionally you may get a good link, in-turn improving your SEO. The plugin is called RSS Footer and can be downloaded here from WordPress. So whilst the plugin might be called Footer – add your links ‘above’ the post content to ensure even people scraping the first paragraph give you some benefit in this whole content stealing. + at the end of the day its all about the link love, isn’t it? I hope you all find this tip useful.